This story has been going on nigh on 5 years and I am sad to inform you that James Takamore will never be buried where he wished to spend his eternity, in Christchurch. After Mr Takamore died in 2007, his whanau from the Eastern Bay of Plenty claimed his body and took it north to bury him – according to their custom – at Kutarere Marae, against the wishes of Ms Clarke. She launched a legal fight to have his body returned to Christchurch, where he had lived for 20 years with her and their two children. In July 2009, the High Court ruled that the relatives who had taken Mr Takamore’s body had done so unlawfully. …the burial of Maori deceased was governed by Maori tikanga (customary practices), because Maori custom was part of common law in New Zealand. 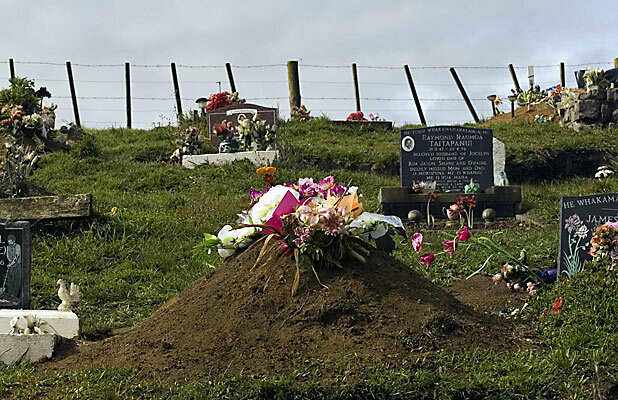 I am sad to tell you this not because I agree, or disagree with, the action of ‘ body snatching…in fact if you speak with many Maori they often take quite a light hearted stance over the event that many non-Maori take as abhorrent. I have heard stories about bodies being taken ‘up North’ but in the journey the snatchers getting hungry so driving through McDonalds Orewa with a coffin on the roof of the car, I have heard stories about snatchers creeping into a room full of sleeping people on all fours to remove a body…when you hear some Maori speak about it they laugh almost like it’s a game…and I think some take it as that, albeit a very serious game, but if you don’t honour the body by staying with it, awake for 24 hours a day…then they’ll take it and do the job. The reason I am saddened by the fact that James Takamore will never be buried in Christchurch is that my sources tell me that the body has already been moved, in other words even if the Supreme Court rule in favour of Mr. Takamore’s Christchurch family only a couple if people know where he is now buried and they won’t reveal it. My sources tell me that shortly after he was first buried, his body was dug up and moved to a new location that only a couple of people know about.